Recently I just come across, What is a history behind the word India means? 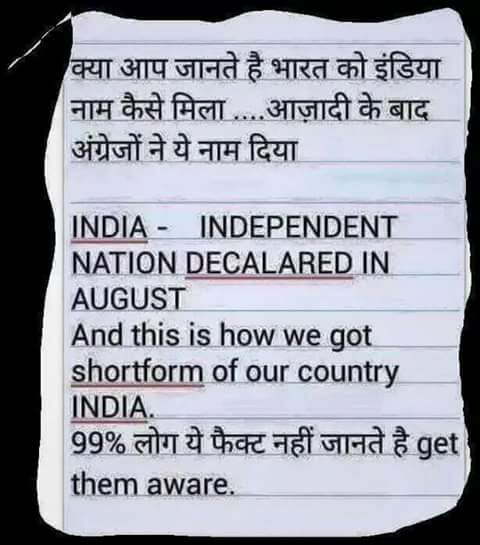 Over social media, with the meaning of the word India. I just see some dumb kind of explanation, put live on social media. The word India Means – Meaning and Derivation of this word India means, is very interesting is very informative and interesting, knowledge growing explanation. Did You Know Word India Means? This is one of the funniest and dumb explanation about the name INDIA means. This Entire Explanation on the Subject of ” The name India Means? is By Mr. Mohan S Negi, Who maintain his personal Blog Mohan S Negi. The fact is that the word India means is derived from Indus. This originates from the Old Persian word Hindus. And gradually developed into the Indus valley civilization. The latter term stems from the Sanskrit word sindhu, which was the historical local appellation for the Indus river. There are seven main tributaries of the one river. The local inhabitants therefore called it sapta-sindhu, meaning the seven rivers. As the seven tributaries are part of the one river, the entire river system came to be known in time as Sindhu. in general, sindhu also means any river or water body in Sanskrit. When persian explorers visited the area even in ancient times, and the Iranian ‘h’ is cognate with Sanskrit ‘s’. Thus then Sindhu became hindu. The name of the river entered Greek from Persian, with the loss of the initial ‘h’, to become indos, from which the Greeks derived their name for the region, India. The Latin form of indos is Indus, the name by which the river system is still known in the west. It’s name was given to the entire subcontinent by the Romans, who adapted it to the current India. And has been in use in Greek, since Herodotus (4th century bc). The word “India” means is the form used by Europeans over the ages.